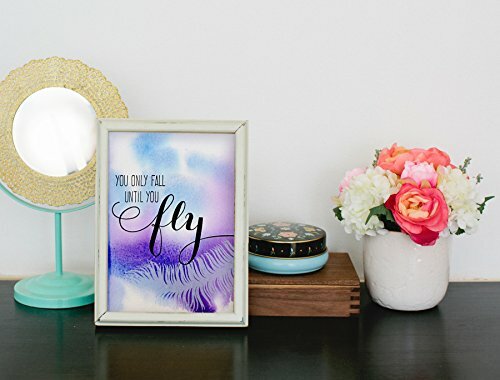 Add a dose of inspiration to your home! I hand painted each piece of 100% recycled, Elemental Chlorine free, 110# bright white cotton paper with a watercolor wash, then printed an original illustration in subtle transparent white ink with my antique letterpress. Finally, I letterpress printed some of my favorite quotes in black ink over the top. The result is this set of three gorgeous, unique letterpress and watercolor prints. Each is absolutely unique (see last photo) and measures 5"x7" and is ready to frame. Numbered and signed on the back: limited edition of 14. Listing is for three prints-one of each design shown. If you have any questions about this product by 622 Press, contact us by completing and submitting the form below. If you are looking for a specif part number, please include it with your message.